An AAV of the U.S. Marine Corps landing at Onslow Beach on Marine Corps Base Camp Lejeune during an exercise in 2015. The AAV-P7/A1 is the current amphibious troop transport of the United States Marine Corps. 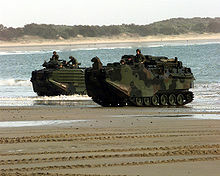 It is used by U.S. Marine Corps Assault Amphibian Battalions to land the surface assault elements of the landing force and their equipment in a single lift from assault shipping during amphibious operations to inland objectives and to conduct mechanized operations and related combat support in subsequent mechanized operations ashore. It is also operated by other forces. Marines call them "amtracks", a shortening of their original designation, "amphibious tractor". In June 2018, the Marine Corps announced they had selected the BAE Systems/Iveco wheeled SuperAV for the Amphibious Combat Vehicle (ACV) program to supplement and ultimately replace the AAV. A pair of U.S. Marine Corps Assault Amphibious Vehicles emerge from the surf onto the sand of Freshwater Beach, Australia. The one on the left has an applique armor kit installed, the one on the right does not. Marines exit from a U.S. Assault Amphibious Vehicle during a live fire exercise in Djibouti, Africa, in 2010. The LVTP-7 was first introduced in 1972 as a replacement for the LVTP-5. In 1982, FMC was contracted to conduct the LVTP-7 Service Life Extension Program, which converted the LVT-7 vehicles to the improved AAV-7A1 vehicle by adding an improved engine, transmission, and weapons system and improving the overall maintainability of the vehicle. The Cummins VT400 diesel engine replaced the GM 8V53T, and this was driven through FMC's HS-400-3A1 transmission. The hydraulic traverse and elevation of the weapon station was replaced by electric motors, which eliminated the danger from hydraulic fluid fires. The suspension and shock absorbers were strengthened as well. The fuel tank was made safer, and a fuel-burning smoke generator system was added. Eight smoke grenade launchers were also placed around the armament station. The headlight clusters were housed in a square recess instead of the earlier round type. The driver was provided with an improved instrument panel and a night vision device, and a new ventilation system was installed. These upgraded vehicles were originally called LVT-7A1, but the Marine Corps renamed the LVTP-7A1 to AAV-7A1 in 1984. Another improvement was added starting in 1987 in the form of a Cadillac Gage weapon station or Up-Gunned Weapon Station (UGWS) which was armed with both a .50 cal (12.7 mm) M2HB machine gun and a Mk-19 40 mm grenade launcher. Enhanced Applique Armor Kits (EAAK) were developed for the AAV-7A1 in 1989 and fitted by 1993, and the added weight of the new armor necessitated the addition of a bow plane kit when operating afloat. The Assault Amphibian Vehicle Reliability, Availability, Maintainability/Rebuild to Standard (AAV RAM/RS) Program was approved in 1997. It encompassed all AAV systems and components to return the AAV to the original vehicle's performance specifications and ensure acceptable readiness until the EFV should become operational. The program replaced both the AAV engine and suspension with US Army M2 Bradley Fighting Vehicle (BFV) components modified for the AAV. Ground clearance returned to 16 inches (40.6 cm) and the horsepower to ton ratio increased from 13 to 1 to its original 17 to 1. The introduction of the BFV components and the rebuild to standard effort was expected to reduce maintenance costs for the expected remaining life of the AAV through the year 2013. In March 2015, SAIC was awarded a contract to perform an AAV survivability upgrade (SU). Marine Corps and SAIC officials unveiled the AAV SU prototype in January 2016, with survivability enhancements including replacing the angled Enhanced Applique Armor Kit with 49 advanced buoyant ceramic armor panels, a bonded spall liner, armor-protected external fuel tanks, an aluminum armor underbelly providing MRAP-equivalent blast protection, and blast mitigating seats as well as a more powerful engine, new suspension system, and increased reserve buoyancy. The AAV SU program was intended to upgrade 392 out of the some 1,000-vehicle fleet to keep them operational through 2035 as the ACV gradually entered service. However, in August 2018 the Marine Corps terminated the AAV upgrade program, instead opting for increased procurement of the ACV. AAVs firing smoke grenades in training. Twenty U.S.-built LVTP-7s were used by Argentina during the 1982 invasion of the Falkland Islands with all of them returning to the Argentine mainland before the war ended. From 1982–1984, LVTP-7s were deployed with U.S. Marines as part of the multi-national peacekeeping force in Beirut, Lebanon. As Marines became increasingly involved in hostilities, several vehicles sustained minor damage from shrapnel and small arms fire. On October 25, 1983 U.S. Marine LVTP-7s conducted a highly successful amphibious landing on the island of Grenada as part of Operation Urgent Fury. It was heavily used in the 1991 Gulf War and Operation Restore Hope. After the 2003 invasion of Iraq, AAV-7A1s were criticized for providing poor protection for the crew and passengers compared with other vehicles, such as the M2 Bradley. Eight were disabled or destroyed during the Battle of Nasiriyah, where they faced RPG, mortar, tank and artillery fire. At least one vehicle was destroyed by fire from friendly A-10 Warthog attack planes. In August 2005, 14 U.S. Marines were killed when their AAV struck a roadside bomb in the Euphrates River valley. Renamed from the Advanced Assault Amphibious Vehicle in late 2003, the Expeditionary Fighting Vehicle (EFV) was designed to replace the ageing AAV. Able to transport a full Marine rifle squad to shore from an amphibious assault ship beyond the horizon with three times the speed in water and about twice the armor of the AAV, and superior firepower as well it was the Marine Corps' number one priority ground weapon system acquisition. The EFV was intended for deployment in 2015. However, in January 2011, United States Defense Secretary Robert Gates announced plans to cancel the Expeditionary Fighting Vehicle. In 2012, the USMC dropped the EFV and cancelled the program. An AAVR-7A1 (recovery vehicle) attached to the 31st Marine Expeditionary Unit splashes into the Pacific Ocean from the well deck of USS Juneau before heading to a beach. LVTP-7: Original series introduced from 1972. Originally armed with a M85 .50cal machine gun. LVTP-7A1: 1982 upgraded. Renamed to AAVP-7A1 from 1984. In the 1970s, the US Army used an LVTP-7 as the basis for their Mobile Test Unit (MTU), a ground-based anti-aircraft high energy laser. After several successful test firings at Redstone Army Arsenal, the laser was reportedly transferred to NASA. KAAV7A1: KAAV7A1 amphibious vehicle series based on AAV-7A1 by Samsung Techwin (now Hanwha Techwin) and BAE systems developed and manufactured in South Korea by Samsung Techwin. The Office of Naval Research (ONR) under the Virtual Training and Environments (VIRTE) program, led by then LCDR Dylan Schmorrow, developed a prototype training system called the AAV Turret Trainer. The system consists of an actual surplus turret mounted with ISMT (Indoor Simulated Marksmanship Trainer) weapons firing on a projected screen displaying the VIRTE Virtual Environment. At total of 15 systems were produced for the USMC and one system for Taiwan. A U.S. Marine AAV destroyed near Nasiriyah in 2003. Spanish marines deploying from an AAV-7 during an exhibition in 2009. Italy: Due to be replaced by the Italian Marines. Japan: Japan Ground SDF has 58 (46 personnel, 6 command and 6 recovery) After a period of testing 6 AAVP-7A1s, Japan on 7 April 2016 announced it would purchase 30 systems. Vehicles are AAV7A1 Reliability, Availability, and Maintainability/Rebuild to Standard (RAM/RS) versions, with a more powerful engine and drive train and an upgraded suspension system, providing improved mobility, command, control, and repair capabilities. Deliveries to take place in mid to late 2017. Taiwan: Republic of China Marine Corps has 54 and 1 AAV Turret Trainer. 36 currently on order for $375 million USD. ^ "LVTP-7 AAVP-7A1 AAV-7 amphibious assault armored vehicle data | United States American Army light armoured vehicle | United States US Army Military equipment UK". ^ "Assault Amphibious Vehicle Systems (AAVS)". Marine Corps Systems Command. 2009-03-19. Archived from the original on March 27, 2008. Retrieved 2010-08-04. ^ USMC AAV7 Assault Amphibious Vehicle survivability upgrade program terminated. Army Recognition. 13 September 2018. ^ Marine Corps Cancels AAV Survivability Upgrade. USNI News. 25 September 2018. ^ Smith, Gordon (1989). Battles of the Falklands War. p. 21. ISBN 9780711017924. ^ BAE wins Marine Corps contract to build new amphibious combat vehicle. Defense News. 19 June 2018. ^ Marines Pick BAE to Build Amphibious Combat Vehicle; Contract Worth Up to $1.2B. USNI News. 19 June 2018. ^ "Virtual reality, real ingenuity". physorg.com. Retrieved 19 February 2016. ^ "TJ, Inc". Tjinc-eng.com. Retrieved 2013-11-16. ^ "Mecatrol". Mecatrol. Retrieved 2013-11-16. ^ "BAE Systems to Provide Assault Amphibious Vehicles to Brazilian Marine Corps". BAE Systems - United States. ^ "Korsel Hibahkan 10 Tank Amfibi Buatan AS untuk RI". Kompas. 14 November 2009. Archived from the original on 17 November 2009. Retrieved 24 December 2014. ^ Jr., Sydney J. Freedberg. "BAE Unveils 1st Amphibious Combat Vehicle For Marines". ^ KALLENDER-UMEZU, PAUL (13 April 2014). "Big-Ticket Buys Could Hurt Japan". www.defensenews.com. Gannett Government Media. Retrieved 13 April 2014. ^ SONODA, KOJI (21 August 2013). "Defense Ministry preparing Japanese version of U.S. Marines". asahi.com. The Asahi Shimbun Company. Retrieved 9 October 2013. ^ Wasserbly, Daniel (7 April 2016). "Japan buys new BAE Systems AAV7A1 amphibious assault vehicles". Jane's IHS 360. Washington, DC: Jane's IHS. Retrieved 8 April 2016. ^ "Obama's Plan to Arm Taiwan". warisboring.com. Retrieved 2015-12-17. Wikimedia Commons has media related to Assault Amphibious Vehicle.